Recently I was just shown an American Flag with 48 gold stars and 48 white stars on the other side. It has the customary red and white stripes. There are no marking anywhere on the flag. The flag hooks are riveted into the inside white stripe with the hooks to fly the flag. This flag was given to a fallen soldier who died on the beaches of Normandy, on June 15, 1944. I have read some of your material [and pages connected] and based on that information, is it possible that only one other flag with all 48 gold stars on one side has been seen? Did it look something like this speculative image? There was actually a 50-star version suggested by vexillologist Ed Mooney to celebrate the 50th Birthday of the 50-Star Flag in 2010, but no 48-star versions ever officially recognized. I don't know if anybody has actually drawn a 48-Star version, so here it is. This flag old. All the stars are embroiled, 48 white stars on one side and 48 gold stars on the other. 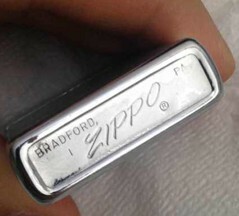 It was given to the family of a fallen soldier who was killed in action on the beach of Normandy. The material is cotton and has the hooks riveted on the white edge! When an American serviceman is buried in a formal military funeral, at the end of the service an American flag is folded in a particular way. The result is a triangular "packet" that only shows on the outside the blue canton covered with stars (i.e. none of the red and white stripes can be seen because of how the flag is folded). After the folding is done, the flag is awarded to the family of the fallen serviceman. So here is my theory. If the family gets awarded a flag like this, and then, say, puts it in an attic or something without unfolding it - what might happen is that the stars on the outside of the folded flag might be more exposed to the elements, and might yellow with age. While the stars on the inside of the folded flag might be more protected from the elements, and so would remain more like new. Then when the flag is finally unfolded the result would be a flag where the stars on one side are "gold", and the stars on the other side are still white. Pure speculation on my part, but perhaps possible. For this to happen, the flag would have had to been folded with the union on one side folded to the outside, the same outside. Wouldn't it seem more likely that the flag had hung against a wall somewhere, and the side catching the light recolouring? I trying to find the identity of a flag that was shown in a video shown at the Trenton New Jersey Visitor's Center, celebrating the "Ten Crucial Days" during the battles of Trenton and Princeton. When asked the people at the visitor's center did not know the identify of the flag shown in the video, which was generated by the New Jersey Network (similar to Public Broadcasting Station (PBS). The video is actually well done and does not contain any of the typical historical inaccuracies one sees in poorly edited videos. The flag has basically about 6 horizontal white stripes alternating with about 6 horizontal blue stirpes; there is no canton. 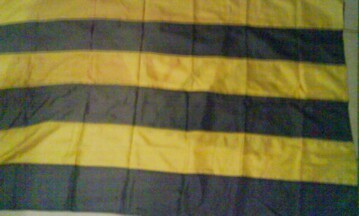 It looks like the Fort Mercer flag but lacks a canton- it has nothing but stripes. It was being carried by a re-enactor across the screen and is clearly seen during the encampment around the Delaware River. The flag might be the flag of a local regiment, but I do not know. Can you help me? I'm trying to get a visual of the flag you describe. Was the top a white stripe or a blue stripe? With 12 stripes it would have a different color stripe at top or bottom. Dark blue or light blue? See attached speculative image. Your picture is very much like what I saw. I cannot say for certain if there were 6 or 7 white or blue strips each, nor if the top one was white or blue. The re-enactor carrying the flag marched across the video screen for about 5 seconds, and I don't want to mislead you. The video was reviewed by consultants at Washington's Crossing for historical accuracy, and the reenactors at Washington's Crossing are very serious about what they do, since they re-enact the Delaware River Crossing each year. So I am confident that it is a real flag at the time. Here is graphical evidence (first flag from top to bottom) (source) that would lead to think that there was a variant flag for Ft. Mercer. Now, I do not know exactly if it is indeed a verified source. Still, I counted 13 stripes (seven blue, six white) though. So perhaps a variant of the Ft. Mercer flag looking something like this? 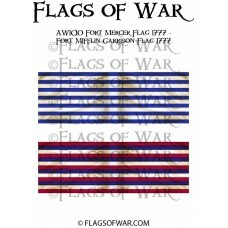 Interesting enough, the Fort Mifflin Garrison Flag, a fort which was located just across the river from Ft. Mercer, had a design with only stripes, but red, blue and white. Please note the source given for this design is a War Games supplier in the UK. They offer a lot of flag images with no primary source. Here's why: There were dozens of Continental Regiments 1775-1781; likewise British and "Hessian" regiments as well. 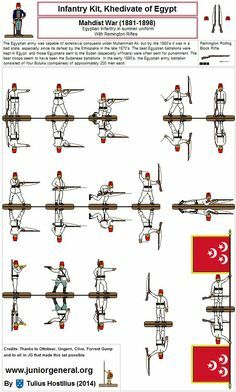 If you are going to play a game with different units or fortifications involved, then each needs its own flag. We know of only a few real American flags from that era. Hence the need for a War Games supplier to make up flags. Now, as far as the reenactors are concerned, take it from me as one who has partaken big time of this hobby (though now pretty much retired from it), you can find all kinds of Farby stuff on the field. Far be it by me to cast aspersions on someone else's impression. I have seen many a doubtful flag carried in the field for the exact same reason as stated above. 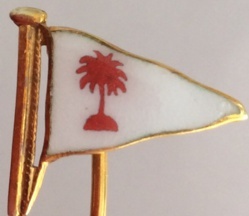 Do you think is a variation of the Egyptian 1940s or 1890s flag? or maybe Turkey? (image source). This is not a flag I recognise, although there are similar flags from Egypt and Turkey. None with the three stars, though. That is the flag of Muhammad Ali Dynasty(Egypt) used 1867-1881. 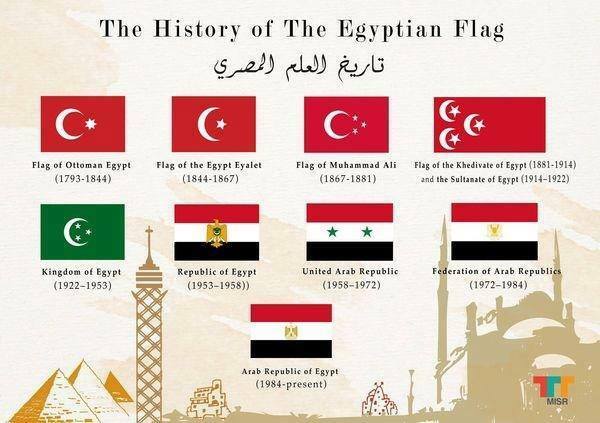 Attached is the chart of Egyptian historical flags although I forgot the information source from Egypt. 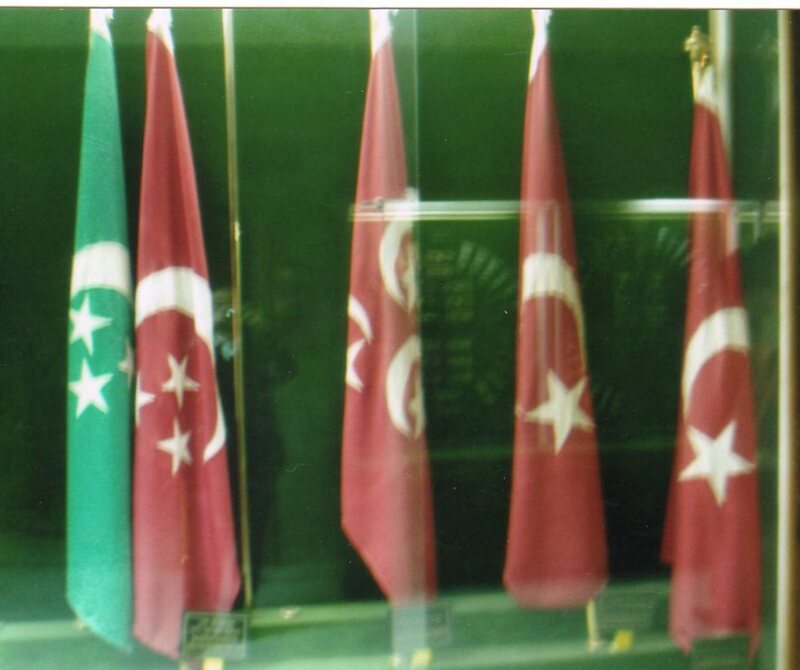 Also attached is a photo of the flag displayed at Cairo Military Museum I took several years ago. FOTW shows something extremely similar as 19th century (presumably latter half) Egyptian full Admiral (2 stars = vice admiral; 1 star = rear admiral.) The difference (between the images, but not necessarily Ottoman vs. Egyptian) is the points on the star (5 vs. 6) and the overall proportions. The FOTW presentation (and possibly its original 1975 Dutch source) might be a bit misleading as it mixes Ottoman Turkish and Egyptian flags - Egypt being in the 19th century independent of Turkey. But, I don't see any link to any site showing any historical picture/image of this purported "Muhammad Ali" flag. - Silk souvenir scarf with flags and emblems of Egypt (obverse) (reverse) (source). 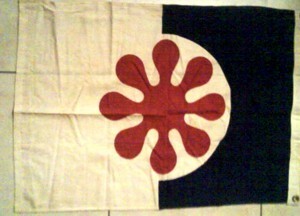 This item shows the flag in question, on the left, in an artifact dated 1900 according to source. It has been officially labeled as "Original souvenir [Souvenir of Egypt]. From the collection of Paula Sanders, Rice University." located at the Travelers in the Middle East Archive (TIMEA) (official website), supported by the Institute of Museum and Library Services (official website), Rice|Ken Kennedy (official website) and (Rice University). Also, the same website states that the flag is that of Mehmet Ali. 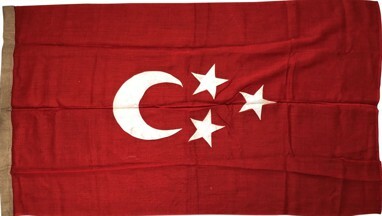 The adjoined paragraph explains: "The Ottoman flag in the nineteenth century normally bore a white star and crescent on its red field, although both Turkish and Egyptian ships very frequently displayed the old, plain red ensign. Muhammad Ali did introduce one distinctive new flag which eventually became the first real Egyptian national flag. Perhaps to symbolize the victory of his armies in three continents (Europe, Asia, and Africa) or his own sovereignty over Egypt, Nubia, and the Sudan, Ali set three white crescents and three stars on a red field. Technically only the personal standard of Muhammad Ali--and of those who followed him as hereditary rules of Egypt under the title of khedive--the flag was at least a mark of distinction between Egypt and Turkey". 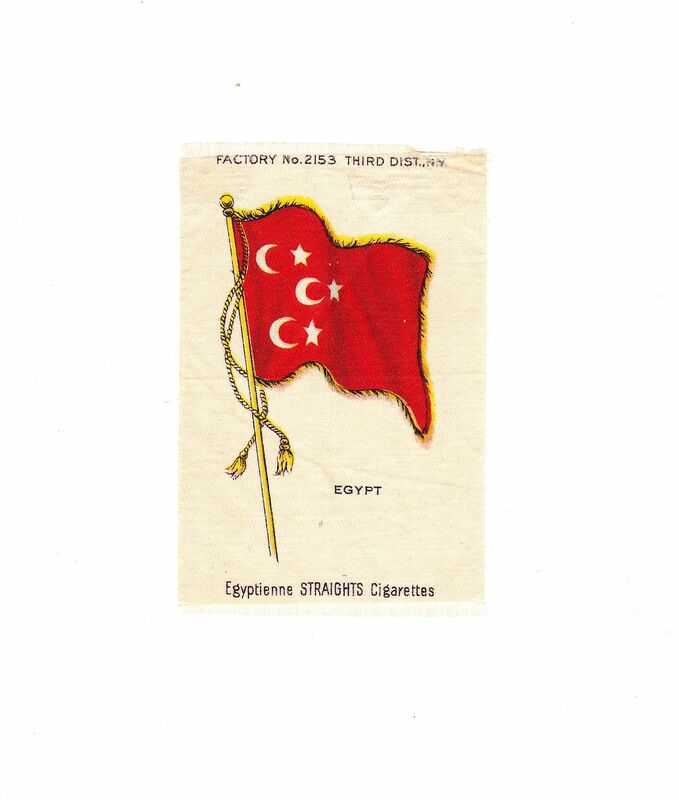 This other source shows (image) (source) mentions the following: "SMALL vintage tobacco premium flag silk - brightly colored Egyptian flag - distributed between 1911 and 1916 with Sovereign Cigarettes, as part of its popular Flags of the World series. Egyptienne Cigarettes, made in New York, was one of several brands sold by the American Tobacco Company. This flag is identified "Egypt" next to the image. "Egyptienne STRAIGHTS Cigarettes" is printed along the lower edge, and the factory number and location are printed along the top. SMALL flag silks measure 3" x 1". 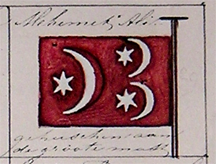 This distinctive personal standard introduced by the Khedive Muhammad Ali - a set three white crescents and three stars on a red field - became the first real Egyptian national flag in the mid 19th century. When Egyptian nationalists in 1882 sought to depose the khedive, Great Britain - occupying Egypt to maintain the Khedivial authority - flew this flag in conjunction with the Union Jack as a symbol of the Egyptian protectorate. During the early 20th Century, American Tobacco Company was one of a number of cigarette companies that gave free silks, flannels or leather to customers who purchased their tobacco products. These textile items were distributed either as an "insert" (sometimes in an envelope, into the tobacco packaging, and sometimes attached to the outside) or as a "premium" (given away in exchange for coupons inserted in the packaging). The small 3" x 1" silks were usually distributed as inserts with the product. The larger silks were usually premiums given in exchange for coupons." 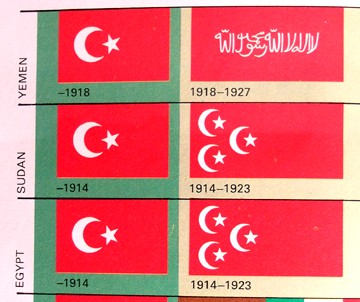 Also, this catalog chart, shows similar flags (image) (source) of the same period, which determines that such flag were used in the period of 1914-1923. Notice that the flag of Muhammad Ali corresponds with the flag of the Grand-admiral of the Porte. It is possible that these flags were also the distinguishing flags of the corresponding ranks of the army but nothing is known about such flags. The flag of Muhammad Ali himself, the six-pointed stars replaced by five-pointed ones was also flown as the personal flags of later rulers of Egypt, bearing the title of khedive and sultan. We may assume that in fact not these titles were symbolized, but the rank of grand-admiral or admiral of the (Egyptian) fleet. It was only abandoned in 1922 with the establishment of the kingdom when it was replaced by a blue flag with the royal arms between four royal crowns in the corners. The coat of arms of the ruler of Egypt showed a crescent and three stars from about the second half of the reign of Muhammad Ali until 1952. The only exception of this rule are the arms of Abbas Hilmi II (1879-1914) who introduced a coat of arms with three crescents and stars in about 1907 and the arms of his successors, sultans of Egypt until 1922." - Admiral and Vali of Egypt's Flag at sea 1848-1867 ("flag according to Gritzner, Maximilian: Flaggen und Banner Landesfarben aller Zivilisierten Staaten der Erde. Nürnberg, 1876 Taf. 64. The stars are seven-pointed"). 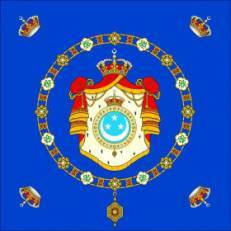 - Khedive's and Sultan's Flag 1867-1922: ("flag according to Admiralty's Flags of the World, 1915 but documented at least from the time of Muhammad Ali"). - Egyptian Royal Flag at sea 1923-1952: ("flag according to many contemporary sources"). 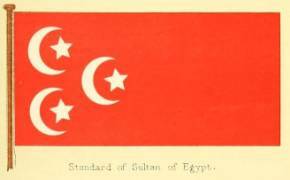 The national flag of Egypt was, in the time of Ottoman rule, the flag of the Government of the Ottoman Empire consisting of a white decrescent-and-star on a red cloth. 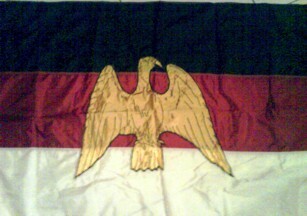 This was the official flag until 1914/1923. 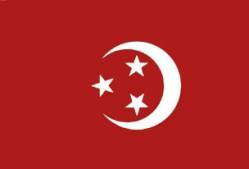 It was replaced in 1914 by the flag of the Commander of the Fleet of Egypt, consisting of three white decrescents-and-stars on a red cloth. 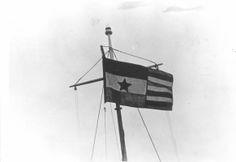 In 1923 this flag was replaced by a white decrescent-and-three stars on a green field. 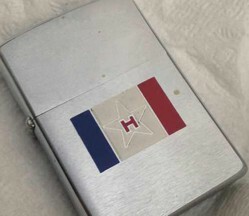 A friend of mine recently discovered this Zippo lighter from 1973 at an antique store in Ohio, which had a French-looking flag that neither of us could identify. The flag has blue, white, and red vertical bars, with the white bar taking up the middle half of the flag. There is also a white star on the flag, with a printed capital "H" inside the star. 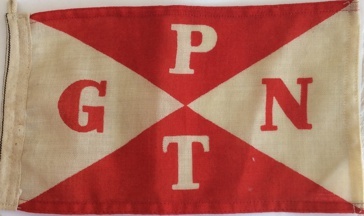 The PGNT flag marked as a shipping line is in fact a boating club. It is the Paddelclub "Gut-Nass" Tegel (Der Paddelclub "Gut-Nass" Tegel) located in Tegel, Berlin, Germany. It is roughly translates as "Canoe Club 'Good and Wet' Tegel". The history of the club indicates it was formed after three acquaintances had to paddle home together in a big storm. I'm trying to clean stuff up. This one looks like I copied something very precisely. I couldn't say what source I copied it from, just that it looks like it's from the time when I copied images as they were. This image could be over twenty years old, migrated from one computer to the next. I can see several mistakes, like I copied a sketch, or something like that. Or indeed a proposal, because the filename of the image was "proposal_a.gif". Other than that, the drawing is exactly how it survived all that time on my computers. Except, I made sure the GIF has a grey background colour and colour 0 set. Does anyone know what we see here? The North Queensland flag includes a marlin. Could the fish on your UFE be a poorly drawn marlin? If so, then your UFE might have been an early proposal for a state flag for North Queensland, in the style of the Australian state flags, rather than the style of Australian territories that was actually adopted by the new state proponents. Looks like a narwhal to me. Given today's date, could it be something to do with the British Arctic Territories? OK, but if it were: What part did something like a sketch or proposal called "a", depicting "an" apparently not very recognisable, narwal on a shield on a blue ensign play in British Arctic Territories' history? Peter Hans van den Muijzenberg, 31 March 2019. According to the BAT Governor General's archives, in the late 19th Century, there was an idea in London of creating a British Arctic territory of sorts well before the modern BAT was established. There was talk of most of upper Canada being a territory that would have been called simply the "British Arctic". Basically, every island in the modern Northwest Territories, and Nunavut, would have made up the territory. Nunavut's islands in Hudson Bay would have been a part of Ontario or Quebec. Someone, lost to us now in history, submitted what would have possibly been the British Arctic's blue ensign with a simple outline of a narwhal on a blue shield. Because the blue shield would've been the same color as the ensign, it would've naturally been put on a white disk, as was the practice for many British ensign badges in those days. As Mrs. A. F. Day was creating her badge for the modern BAT ensign set, her first daughter, April, who was 10 years old at the time, suggested that mother use a polar bear instead of a narwhal, arctic aardvark, or any other indigenous animal, as the polar bear was easily the most familiar arctic animal in the world, and represented strength and nobility. Additionally, most of April's friends thought that a narwhal was only an imaginary unicorn fish. Speaking of April, she grew up to be a very beautiful young woman and represented the BAT in the Miss Universe pageant from 2005 to 2008. April is now married, with a family of her own. She has four daughters with a fifth on the way. She eventually married a French surfer dude from Tahiti, and they divide their time between Tahiti, and the BAT. Can you imagine that contrast!! 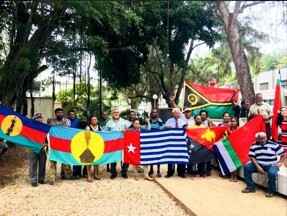 These 13 Unknown Flags were sent in for identification by Fred Drews on 13 April 2018 without any text to help identify them except brief comments/titles. 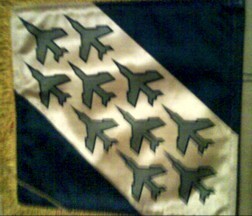 Perhaps a two-sided French Air Force ensign? 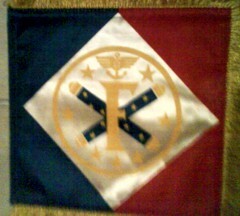 Could this be the personal flag of a certain Maréchal de France who had formerly been an air force officer? Again, I have no expertise in such matters, but this is nothing like rank flags located on our (Marshal of France ) or (France: Flag officers) pages. You are close, but this is a tricky one! The unidentified flag is the unit pennant of the legendary aircraft carrier Foch (R99). The marshal's batons refer to the vessel's namesake, Ferdinand Foch (1851-1929), elevated to Marshal of France in 1918. The Foch served from 1963 to 2000, when it was decommissioned and sold to the Brazilian Navy. Renamed to São Paulo (A12), the vessel was decommissioned in February 2017. See source#1 for a slightly different design of the pennant. See our France: Navy unit pennants page for general background on the French Navy unit pennants. Planes on a narrow stripe in the blue, and the possible reverse an anchor with wings. The obvious association is a flight deck and a flight deck carrier. The batons would seem a bit high rank for a single ship, though. Who fills in the blanks? The blanks are filled, this is a single flag, and the batons are related to the ship's namesake. The building of the Foch started in Saint-Nazaire in 1957. Once completed, the hull was tugged to Brest in 1959; the Foch was inaugurated on 23 July 1960 in the presence of the Marshal's family. Commissioned on 15 July 1963, the Foch was first stationed in Brest, before being transferred in 1976 to Toulon. The Foch returned in April 2000 from her last operational mission, (Myrrhe), after having sailed more than one million nautical miles, representing 3,000 days at sea and 20,000 hours in service. Sources: Dedicated section on the Net-Marine website and here for a slightly different design of the pennant. 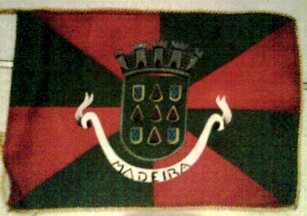 The city of Madeira, according to the silver crown of five visible towers and the gyronny of eight background. Pre-autonomy flag? I would like to point out the striking similarity between this unidentified flag and the flag of Funchal, the capital of Portugal's Autonomous Region of Madeira. 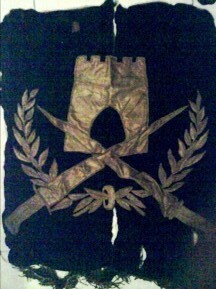 The coat-of-arms is a crude version with different lettering, and the flag's colours are different, too. Hence, I cannot solve the riddle, but I hope this is able to help a bit. Indeed, its symbols would appear to represent the same entity, except that different colours were used. However, according to the scroll the city is called "Madeira", rather than Funchal. Of course, it's not unheard of that an island is as its capital or vice versa. The latter is the capital of the autonomous region, but the whole construct would contain several more entities, and being non-Portuguese I won't hazard to guess which entities are called "Madeira" and which ""Funchal". So far my only guess is that before the region became autonomous, it might have been a district, which could have been called "Madeira" and might have had such a flag. Hence, my guess that it might be a "Pre-autonomy flag". I've drawn a best guess regarding what it would look like with enough light. Artists should feel free to improve; Sérgio Horta is the artist attributed for the Funchal flag drawing, that I borrowed most parts of. The background colours in my opinion should be red and green, look at the dark gyron in lower hoist, it has the same colour as the shield background. Otherwise I agree in most points with you. The only thing really disturbing is the scroll's inscription. In the 1930s the municipal symbols project was enforced by the CHAAP, and normally the flag colours shouldn't be those of the Portuguese national flag. Some municipalities had however ignored this. As Funchal had no good reputation (see António's report) within the Portuguese government, in this case the colours might have been rejected by the CHAAP, which was no problem in at least one other city: Fiães. Maybe, the people there were less obedient. 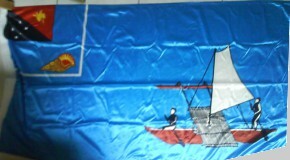 On the other hand it might be the reverse of an older Portuguese flag, it it wouldn't be gyronny. It is not more than an educated guess, but it might be more likely a rejected proposal, made between 1910 (after the monarchy had been abolished) and the early 1930s, when the municipal symbols project had been started. A UFE with 3 blue and 3 yellow stripes. A friend brought it in Boston. 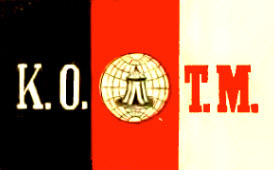 (Size 2' x 3'). Perhaps an Australia religious flag? The three vertical stripes N-R-W suggest the flag of the Knights of the Macabees fraternal organization, although I have only seen it sometimes with the initials "K.O.." on the black and "T.M." on the white but always with a circular emblem in the center of the red bearing a tent on a globe (US Patent #D0021975, 11/8/1892 to N.S. Boynton of Port Huron, Michigan), so maybe not. 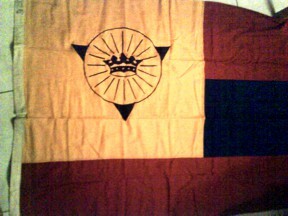 The stripes are blue with yellow star, then red with yellow cross, then white with a yellow crown with fringe. 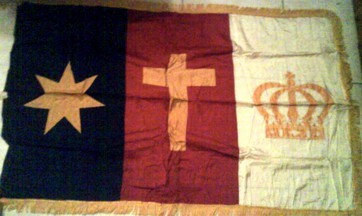 A friend brought it in Sydney, and was told it was an old Christian flag. (Size 4' x 6'). A friend got it with a set of flags in Norway. I remembered Fred first reported UFE18-34f on 13 September 2010 as UFE10-44 (although with a more blue rather than black hoist color) receiving some speculation at the time, but no identification. This is a different photograph from the one from the first time he asked. If you then have reopened communications, could he answer the questions asked so far, and maybe give us a close-up of the details? Looks a bit like a revolutionary period flag. More likely a 20th century US flag evoking the Revolution in some way (something "patriotic"?). The iconography of the sword and tricorne is definitely not 18th century. Note that there are 11 stripes, not 13. The image is shrunk too much to make out the "sword" very well. You might want to post an enlarged clos-up of the canton. The style of sword could be a major clue. Eleven stripes blue over white. Looks unfinished with the charge of the canton looking incomplete. I can identify this flag with certainty as the Yankee Homecoming Flag of Newburyport, Massachusetts. See Flag has become festival's symbol by Victor Tine in the Newburyport News (July 30, 2010). Perhaps a German city? Purchased in Germany by a friend. 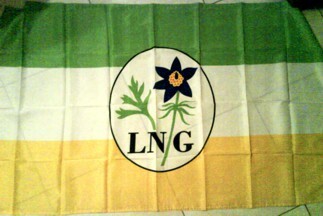 This is the flag of the landesverband niedersÃƒÆ’Ã‚Â¤chsischer gartenfreunde, in Germany. A West New Britain province in the canton, maybe a city in that province? Styled as an ensign including the Papua New Guinea flag and a shell, included on a flag showing an outrigger canoe. Don't know whether the details of the canoe tell us more. However, that's not really the PNG ensign, and the whole thing has an impression of a naive artwork over it. Is this actually a flag? Might be an English Pennant? Blunt tip. 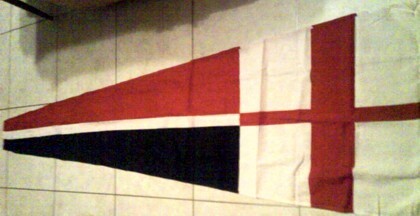 Somewhat similar to the church pennants, but the narrow middle stripe suggests a more modern origin. A photograph that includes the hoist may tell us what the intended way of hoisting is. Looks like a religious flag, says made in the US. Could be a German flag? Black, red, white stripes. Has a bird on it in a style close to one we looked at earlier. A Military banner? Perhaps artillery? Unknown country. This seems not just tattered, but also crudely made - perhaps homemade. Those are crossed bayonets, so it is not likely artillery. The handles of the two bayonets seem to be different, and that suggests something significant. The blades are so crumpled that they look like tinfoil pasted on cloth. The overall style of the bayonets seems to be first half of 20th century. Please ask Fred how large all these flags are. Are these large tears or small bits of cloth? Also, are these fire arms of blades with sheaths? Mysterious Welsh Flag at 1950 British Empire Games. Having watched old footage of the 1950 games opening ceremony hosted in Auckland, New Zealand, I came across this rather unusual flag in which Wales competed under at these games. It appears to be a light (probably red?) dragon on a dark background. It's strange, given that the traditional red dragon on a green and white shield was used at the inaugural British Empire Games 20 years previous, in 1930. I very much doubt it's the "Black Dragon" flag used by a section of the Republican movement. Does anyone have any information on this flag? 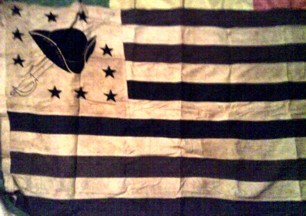 Or have I unearthed a rare and secret flag? It's tough to tell from the photo, but it does seem to be a dragon on a non-white background. Brady mentions "footage", so it may be possible to find the entire film-strip. In a previous post, I replied that the flag in question was that of Malaya. Now that I've come across this, I must say that since the original topic was the Welsh flag, I also spotted some additional information on Malaya. Hence, my reply is not pertaining to the Welsh flag at the 1950 games. In fact, such a flag seems to display simply the dragon on a red background, as forwarded by Jason Saber, originally mentioned by Brad Ells on FOTW-Facebook. We totally forgot to include the original footage of 1950 British Empire Games (at 8.44 of the first video) as provided by Jason Saber. Found this interesting flag on Fotogalerija|Arhiv Znaci. Its nearly all about the Jugoslavian commie partisans. The flag looks like a combination of the two flags presented on FOTW at the National Liberation Movement (Yugoslavia, Second World War): Note that there is also a (source) displaying the same flag. 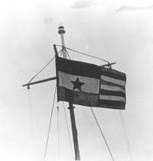 The star is a "fat" variant, but centered, smaller than in the images we currently present, and no accompanying anchor. Well identified indeed Tomislav, but given the conditions in German occupied Yugoslavia during three years a little variation is to be expected is it not?